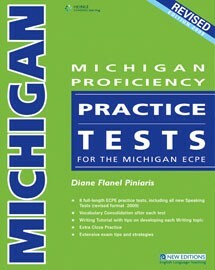 8 complete ECPE practice tests. 8 speaking tests reflecting the revised speaking format as of June 2009. 32 pages of Vocabulary Consolidation exercises that recycle the vocabulary in each test. A Writing Tutorial with hints for developing each composition. A special section with test-taking strategies for each part of the exam. A Teacher’s Book which contains answers to tests and exercises, model compositions and complete listening tapescript.